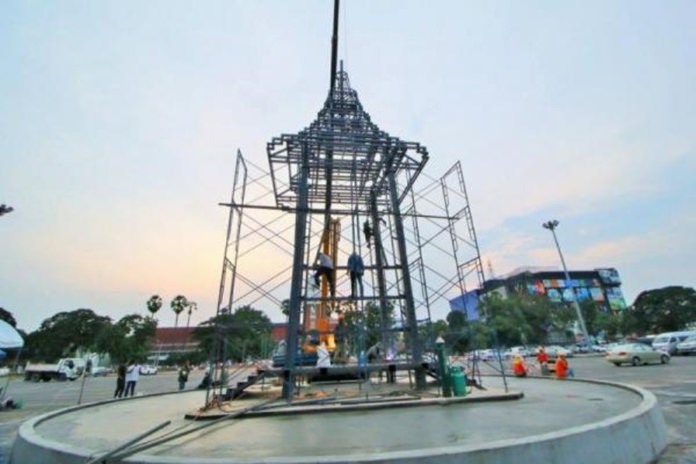 The Government has assigned relevant agencies to construct replicas of the Royal Crematorium across the country for the Royal Cremation of His Majesty King Bhumibol Adulyadej. His Majesty King Maha Vajiralongkorn Bodindra­debayavarangkun requested the construction of replicas of the Royal Crematorium at which the people may offer sandalwood flowers during the Royal Cremation Ceremony for His Majesty King Bhumibol. Government Spokesman Lieutenant General Sansern Kaewkumnerd briefed a press conference on the progress of the construction of the replicas after meetings of the National Council for Peace and Order and the Cabinet on 12 September 2017. 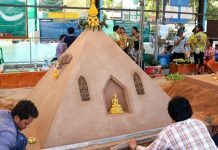 He said that a total of 85 replicas of the Royal Crematorium were being constructed. Out of this number, 76 are located in 76 provinces and nine in Bangkok and nearby provinces. In Pattaya, the replica is located at Wat Chaiyamongkol on South Pattaya Road. The replicas of the Royal Crematorium are in the form of a pavilion, measuring 22.53 meters from the base to the top. The constructions were completed by 15 October.